Among the works I include in the latter trend, the worst is probably the series Nine Discourses on Commodus, painted in reaction to JFK’s assassination, dixit Twombly. On a grey background, some cockscomb-like yellow, pink and red outbursts make for nine canvases aligned without grace or purity —the Emperor’s psychology translated in impulsions of color. To me, the constant anchoring to Antiquity, the pseudo-historicity, the titles ceaselessly referencing Virgil, Homer, Troy (to use “Iliam” instead of “Ilium” because the “A” embodies virility is nothing but pedantic), Sesostris and Ra, Achilles and Patroclus, somewhat jumbled together, reveal Twombly’s “model student” dimension, as a cultured American wed to an aristocrat from Rome, impressing his puritan provincial fellow countrymen with Mediterranean culture and sensuality (which don’t ring true, in my eyes). This naïve thirst for grandiosity leaves me indifferent. On the contrary, Cy Twombly’s first paintings, austere scratches, or his return after 1964 to black and grey backgrounds on which white wax traces sketches and diagrams (pictured first), or his series A Gathering of Time, precious white bombs exploding on ethereal backgrounds, are all wonderful in their purity and pared down simplicity, stripped of the whole neoclassic expressionist pathos of his other works. (Despite its title, I would add to these the first series of large red and white Bacchus (pictured last).) However, as he remarked after Commodus, these artworks were created in response to the lack of critical and commercial success of his previous paintings. 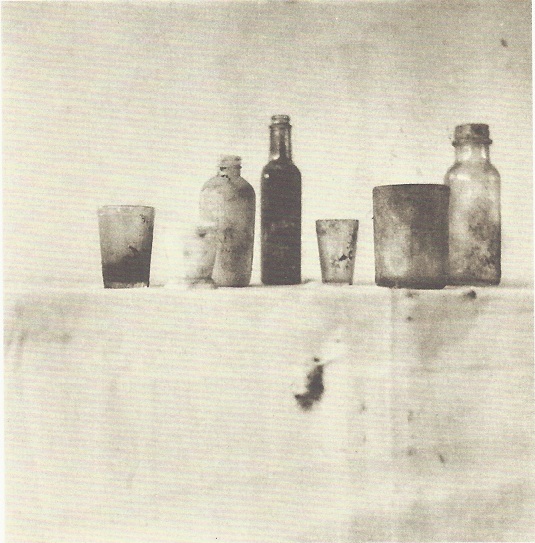 Where to place the —fluctuating— truth of Twombly’s construction/destruction of painting? There are some very beautiful little sculptures, assemblages of objects coated in white paint and plaster. The title and aspect of the sculpture pictured above evoke ancient Egyptian funerary boats, going from the right bank of the Nile, symbolizing life, to the left bank, the mortuary one (Caravaggio died at Porto Ercole, another reference…). 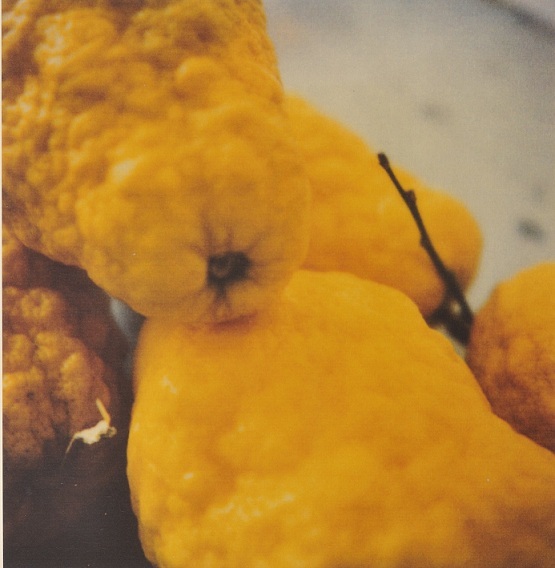 And some superb photographs: as early as 1951, at the Black Mountain College, he creates still lifes of glasses and bottles echoing Morandi; in 1953, an abstract, minimal interplay picturing a table and its tablecloth; later, a few sensual Polaroids in pastel colors, discrete short poems, like these lemons from Gaeta. When he lets go in this way, without showing off his culture or calculating his effects, Twombly is at is best, in my eyes. Original publication date by Lunettes rouges: February 11, 2017.